Impressively, despite government backed hostility and incitement, 20,000-30,000 demonstrators marched on Saturday, 11 August, in central Tel Aviv demanding the repeal of the new Nationality Law. The demonstration ended a third consecutive week in which tens of thousands of people filled the streets of Tel Aviv to protest against discriminatory policies of the Netanyahu regime. This year has seen the stormiest struggles against government policies since the 2011 mass protests. The Follow-Up Committee’s appeal to mobilize for this protest was joined by over 25 political parties and organizations and civil society associations, who jointly called to mobilize for the success of the event, including the Socialist Struggle Movement (CWI). This was the boldest of the important demonstrations organized in Israel in recent weeks. But it was important not only because of its approach to the “divide and rule” policies but also because of its composition – a joint demonstration with a high presence of both Jews and Arab-Palestinians (and not from one exclusive ethnic or religious background). Demonstrators came from all over the country, including from dozens of Arab towns and communities. A demonstration of this sort on the scale of tens of thousands has not been seen for years, and may even had been the largest of its kind. The protest march completely filled the two wide lanes of Ibn Gabirol Street in the center of Tel Aviv. It was noisy, energetic, diverse and full of solidarity – with slogans in Hebrew and Arabic, with thousands of placards against the Nationality Law and for equality. And it was “colorful” in flags: with visible Palestinian and Israeli national flags, as well as pride flags, red flags and black flags for mourning. The slogan “The People Want/Demand to Repeal the Law” was shouted in Hebrew and Arabic along the march in the spirit of the ‘Arab Spring’ and the protests of 2011. Alongside it echoed the slogans “We won’t remain silent till the law is repealed” and of course “Bibi [Netanyahu], Go Home!” Socialist Struggle activists also participated in leading these and other slogans, joined by Jewish and Arabic demonstrators — among other things, we called: “The answer to discrimination, struggle against the government”, “We’ll fight, protest, strike, till the law is repealed” and “Demanding equality and welfare, not racism and incitement”. The nationally mixed charter of the demonstration was not to be taken for granted, given the deep national schism and the incitement campaign organized specifically against it, and which continued all the more forcefully the following morning. Netanyahu, together with government ministers, and with the generous help of the leaders of the ‘opposition’ parties Gabbay, Livni and Lapid, did everything possible to sow division between Jews and Arabs and to isolate those who protested on Saturday evening from the rest of the broad public in Israel. They were not cheap in the amount of demagoguery and exploitation of existential fears they resorted to. At the start of the weekly Cabinet meeting on Sunday morning, Netanyahu claimed that the demonstration only proved the necessity of the Nationality Law. In other words, the new Basic Law is allegedly necessary to prevent a situation where the demand for recognition of the national rights of the Arab-Palestinian minority in Israel will be officially addressed. Netanyahu and the rest of the enemies of equality in power recycle the nationalistic mantra that granting equal rights to the Arab-Palestinian minority in Israel would harm the rights of the Jewish majority and come at its expense. This is part of the logic of the Nationality Law which seeks, alongside the government’s opposition to the establishment of a Palestinian state, to negate Palestinian national rights, including the right to self-determination, in order to allegedly “ensure” the right of self-determination of Jews in Israel. In the face of this twisted logic, it should be emphasized that the right to self-determination in any case is not an excuse for discrimination, and that an equal right to self-determination should be promoted for both national groups, without discrimination. “What we saw yesterday at the demonstration in Tel Aviv is the Fifth Column which is in the State of Israel”, declared the Minister of Economy and Industry, Eli Cohen, of the Kulanu party. Culture Minister Miri Regev explained that “the link-up of the left with the Arabs is absurd”. The recent spin which fuelled the delegitimization campaign against the demonstration and those who took part in it, was the singling-out of those few dozens of demonstrators who came to the demonstration with Palestinian national flags, which, as mentioned, were waved alongside other flags and placards in a diverse demonstration of various forces opposing the Nationality Law. Civil equality certainly exists? Where? In what spheres can we say that there is full genuine and practical equality on the day-to-day life between Jewish and Arab citizens? At least in relation to the negation of national rights for minorities Shaked was more honest. The Nationality Law is first and foremost an attack which seeks to further erase the national rights of the Arab-Palestinian minority in Israel. Thus some of the Palestinian citizens of Israel who demonstrated wished to remind that they exist and that they have the right to demand full equality, including democratic recognition of national rights. The ‘Palestinian flag scandal’ was a predictable propaganda spin. It was also clear in advance that anything from a few dozens to hundreds of young people would choose to wave the Palestinian national flag at the demonstration. Among the parties and forces that make up the High Follow-Up Committee for the Arab Public in Israel, there were some doubts and controversy over the issue of the flags, apparently due to a desire that the demonstration should also appeal to the broadest possible layers of the Jewish public, without the government being able to isolate it as an exclusively ‘Arab’ demonstration. Finally it was decided, after consultation with activists from several other organizations, to ‘ban’ any waving of national and party political flags at the demonstration. According to Israeli news website, Davar Rishon, there was even a strange plan to hire about 80 security guards to ‘clean’ the demonstration from Palestinian flags. Thankfully, this decision was cancelled at the last moment. On the ground it was quite clear that both the Palestinian flag and the Israeli flag would be in any case – regardless of what the organizers would decide on the matter – an integral part of the demonstration and of the general outlook, the consciousness, of the broad layers who oppose the Nationality Law and the right-wing government at this stage. For example, for some of the young Palestinians, the meaning of marching at the heart of Tel Aviv under the Palestinian flag is expressing opposition to the erasing of their national identity and to the continuation of their discrimination and oppression on the basis of nationality. For some of the Jews who came with the Israeli flag, the flag of the state, it was an attempt on their part to clarify that they are ‘part of Israeli society’ and ‘not against the state’, in the face of the incitement of the right-wing regime which attempts to delegitimize their views and label them as ‘traitors’. In a way, the carrying of both flags reflected the fact that there are two nationalities living here — both of which should have equal rights – and that there is a need for a joint struggle against repression and for fundamental change. In response to the right-wing nationalist demagogic attacks against the demonstration, the chairman of the Follow-Up Committee, Muhammad Barakeh (from Hadash/Al-Jabha), was eventually pushed to recognize the reality on the ground and opened his speech precisely by defending the right to wave the Palestinian flag. After the demonstration, various speakers, Jews and Arabs, repeatedly emphasized that this is a democratic right. Socialists are among those who defend this right. As for the attempt to forbid waving of political party flags, then if there is a problem with the presence of certain political forces because they are hostile to the aims of the demonstration, it is necessary to oppose specifically the participation of those forces. But it is important to insist that in any demonstration political organizations that identify with its aims, including organizations and parties facing incitement and persecution, could act in a manner open and transparent to the public, to show their strength, to try to convince others of their views and to illustrate that the movement on the ground is composed of various currents. Such an open approach is not in contradiction to the advancing of collaboration and unity around the protests’ central messages at demonstrations on the ground with the aim of mobilizing broad unorganized layers into action. It was possible to predict in advance the demagogic attack and help prepare the demonstration a little more for it. It was possible to clarify in advance more sharply that the struggle is common to broad layers of the two national groups, and that it is essentially required in order to block and push back the government attacks. Moreover, it was desirable to clarify that the demonstration is obviously open to broad layers of Jews, Arabs and others, and that while the organizers themselves did not intend to bring any national flags, there’s certainly a place for citizens who support the cause of the demonstration and feel the need to bring their flag. It was also possible and appropriate to call upon LGBT-rights activists who wish so to bring Pride flags with them, as some did. Alongside such an inclusive approach, which could have helped to strengthen tolerance in the ranks of the demonstration, it could have been emphasized ahead that any attempt to incite against the legitimacy of waving a Palestinian flag is part of the government’s incitement-tactics around the Nationality Law. It was not reasonable to plan in any way to forcibly remove Palestinian national flags, or Israeli, waved by peaceful demonstrators. While it is necessary to strive for a broad and united movement on the ground, there is no contradiction between defending the legitimate right of Palestinian citizens of Israel to raise a national flag and the struggle against the Nationality Law, which discriminates on the basis of nationality. Even more, defending this right should be a part of this struggle. What could have further helped for the building of a broad united movement is an explanatory line emphasizing that equality of rights between Jews and Arabs, Israelis and Palestinians, doesn’t genuinely threaten to negate the right for existence or self-determination for either of the sides. Such an approach, linked to joint struggles against oppression, for the defence of democratic rights and around common goals, is a must in order to overcome a reality of national division, discrimination and a never-ending conflict between the two peoples. However, due to the weakness of the left, the role of organizing this central and important demonstration was left on the doorstep of the Follow-Up Committee alone, which doesn’t include only left-wing forces. There was a certain weakness in the list of speakers, which included also pro-capitalist elite elements, such as Haaretz publisher Amos Schocken and the former president of the Bezalel Academy arts college, Eva Illouz. Such figures certainly don’t assist strengthening the appeal to broad layers of the Israeli working classs public. If left-wing workers’ representatives and neighbourhood activists had spoken from the stage, such voices could have contributed much more to an appeal on the basis of the problems, the plights and the common class interests, and to call for a broad struggle against the government’s destructive policies in all spheres. The Follow-Up Committee was pushed to respond to the Nationality Law and organize protests but this was the result of pressure from below “which led to the exceptional decision that the public protest measures would not be carried out in Arab communities, but would reach the very heart of the country” as Jack Khoury from the Haaretz newspaper described. The idea of a large demonstration at the heart of Tel-Aviv was seemingly influenced by the day of strike and the huge rally on July 22 against LGBT discrimination. Mohammed Barakeh promised in his speech: “We aren’t going to rest after this incredible demonstration. Here we are marking the beginning of the path of no return till this abominable law is repealed. Our struggle’s arena will be here in this country. A popular, parliamentary and democratic struggle, both of Arabs and of Jews”. This is the required direction, but a declaration of concrete steps, such as another mass protest rally or a call for an ‘equality strike’, following the example of the pro-LGBT protest strike, was missing. Now what is required is a strategy based on linking-up struggles and building a broad movement on the ground. The potential for such a link-up was well illustrated with the march on Saturday evening, but also by the mass roars against the Nationality Law and against Netanyahu at the huge rally against LGBT discrimination. The ‘Druze protest’ against the Nationality Law also attracted layers interested in linking-up with other sectors which are going out to fight against the discrimination policies of the Netanyahu government, rather than aloofness and staying separate under narrow, and even right-wing, ethnic messages. 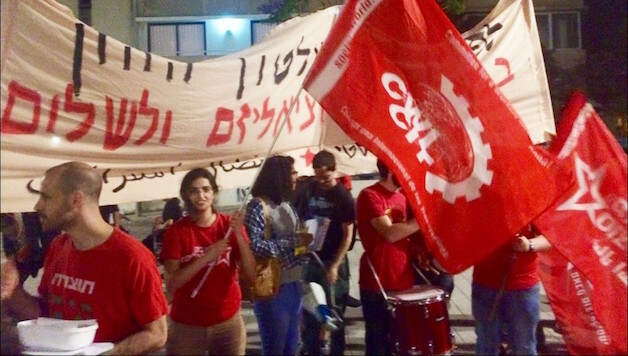 Significantly, the trade union organization Power to the Workers published a principled declaration against the Nationality Law, which includes opposition to “any legislation aimed to sow conflict and division between different parts of the Israeli working class”. This is a very important example for the workers’ Histadrut and the rest of the workers’ organizations in Israel. The great challenge now remains to continue to build the struggle on the ground, with the aim of throwing away the Nationality Law, along with all other discriminatory laws and the racist government of capital into the dustbin of history.